Increased abdominal pain experienced by people when riding in a car which traverses speed bumps has been found to be a symptom of appendicitis. As usual, several media outlets reported this topic uncritically. Medpage Today even had a video explanation of the results by an internist who suggested that this finding might one day lead to fewer CT scans being done. Researchers from the UK prospectively questioned 101 patients with possible appendicitis, 68 of whom had ridden over speed bumps on the way to the hospital. Four were excluded because of missing data. Increased speed bump-related pain was experienced by 54 patients, and 33 of them had appendicitis. Ten patients had no speed bump-related pain with only 1 having appendicitis. A confirmed diagnosis of appendicitis was found in 34 patients, 33 of whom had worsened pain over speed bumps, sensitivity = 97% (85% to 100%) and specificity = 30% (15% to 49%). Positive predictive value = 61% (47% to 74%); and negative predictive value = 90% (56% to 100%). The likelihood ratios (LRs) were 1.4 (1.1 to 1.8) for a positive test result and 0.1 (0.0 to 0.7) for a negative result. What does a likelihood ratio mean? 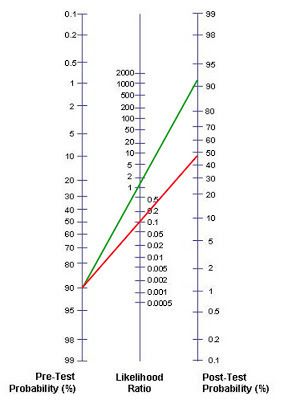 For a positive LR of 1.4: The following nomogram illustrates that if after you assess a patient with abdominal pain, you think he has a 90% chance of having appendicitis then a positive speed bump test would increase his odds of having appendicitis from 90% to about 92%. The green line starts at 90% and crosses the middle line at 1.4. For a negative LR of 0.1: Suppose the patient went over a speed bump and said he had no pain but based on other signs and symptoms, you still think he has a 90% chance of having appendicitis. 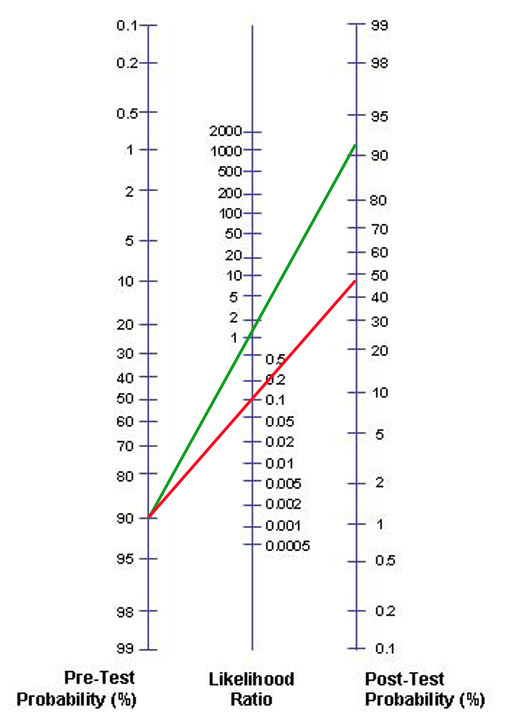 The red line shows that a negative LR of 0.1 would give you a 48% chance that the patient actually has appendicitis. That’s not enough to convince you not to operate. You can see that the speed bump test adds very little to the diagnostic workup for appendicitis. As the MedPage video stated, it is well-known that pain with motion is a symptom that is often found in patients with peritonitis. I always have asked questions related to pain during the car ride to the hospital or when riding the gurney ride to and from CT.
Further proof of the lack of utility of the test is found in the paper itself, published in the British Medical Journal. Full text here. This is very old data. The standard of care in this part of the 21st century is that the negative rate should be well below 10%. My own rate of negative appendectomy for my last 200 cases is 4.5%. The negative appendectomy rate for the speed bump study was not mentioned in any of the media reports nor is it in the abstract. But the full text of the paper reveals that the negative appendectomy rate in this study was 20%. I don’t see this test replacing CT scanning any time soon. Once again to get the facts, you have to read the whole paper, not just the abstract or the press release. My negative rate seems to be around 0% because (very rarely) after 24 hrs of observation, off abxs, and pt still w/ RLQ pain, I take them to the OR and place in a laparoscope. To me the appendix looks normal. I think to myself, well that's not the problem. Then I grab the appendix with a Babcock and dissect it out. Pathology always reports appendicitis and somehow the patient's problem is always resolved the next day. I suppose either the pt had resolving appy and under the microscope it is appendicitis, or by grasping and manipulating it, I caused the "appendicitis". However, in this day and age, the CT scans are sooo good, it is hard not to see real appendiceal inflammation. I would argue the negative rate should be <5 % for sure. I agree that what looks normal grossly in the OR often is reported as appendicitis on pathology. I always remove it. If the patient signs for an appendectomy, he gets one. There is minimal risk, and that appendix will not bother him in the future. In the paper about speed bumps, they found 7 other normal appear appyendices that they did not remove because other pathology was also seen. Based on that, their normal rate may have been even higher. Nothing like seeing a lap appy scar and then being told the patient's appendix was removed, but it is still there on CT scan. Last year we had a patient who had a lap chole, scars and all, who still had a gallbladder. And she was done in Florida. scary. I think there is essentially nil in risk with putting a stapler across the appendix once you are in. I agree with everything you said, including the scary part. Perhaps the article should have been entitled "Taking a history and examining the patient may be clinically useful". Yes, that's another way to look at it.